While recently cruising Etsy for the finest in handmade cat-themed goods, I stumbled upon the store of Em & Sprout. This squee-inducing shop features apparel and accessories in impossibly cute motifs such as cupcakes, penguins, pandas, and of course.. cats! 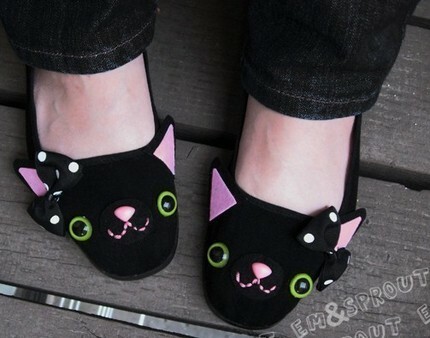 The first item I fell head over heels for was the Happy Kitty Mary Jane Shoes , $22.00 (pictured above). Hand designed and embellished with love, these unique flats are the ultimate in cat lady couture! Winking Kitty Pink Tote, $14.00. 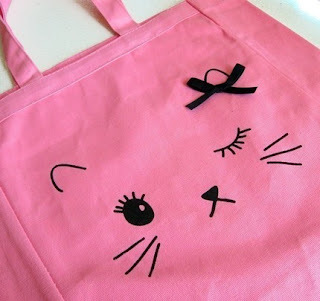 Bubblegum pink + bows make this one tote-ally charming cheshire. 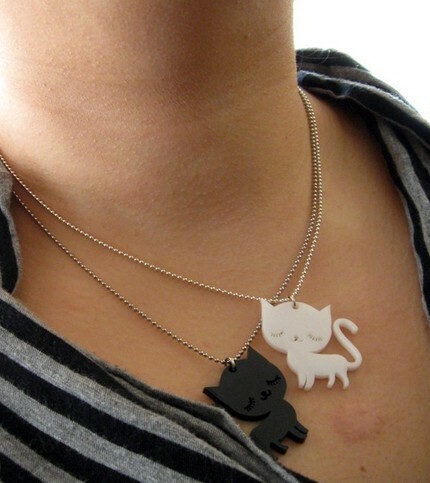 The Sleepy Kitty Cat Acrylic Necklace - Black or White, $10.00 is beyond adorable. I love their sweet, sleepy time expressions! 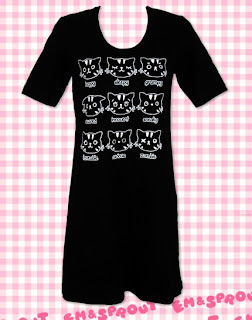 Several designs, including the one pictured on the Moody Cats Dress, $22.00 are also available for purchase on tees and totes. In addition to having crazy cute gear and super reasonable prices, Em & Sprout is also a member of team efa, "a collective of artists on Etsy.com who love and help animals, many of whom donate a portion of their sales to animal rescues & charities." So what are you waiting for? 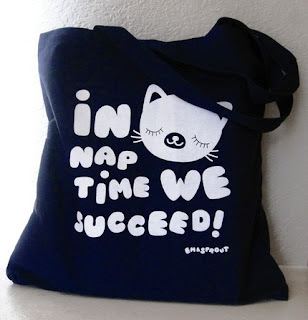 Check out the store today at http://www.etsy.com/shop/emandsprout. such cute items!! Adorable! I love the cat shoes and the T-shirt!